1. What is ceramic ring? 4. How to care ceramic rings? When most people think of ceramic materials, they imagine clay and pottery. Ceramic jewelry can be made from these materials, such as ceramic rings. Ceramic rings are different from the ceramics you find in handicraft stores or family stores. Most ceramic rings are made of titanium carbide. It is a material composed of titanium metal and carbon atoms. Jewelry-grade ceramics have an incredible hardness and are virtually scratch-resistant. The luster of the ceramic ring is very similar to a tungsten ring, and its surface gloss will last a lifetime. Ceramic rings are very wear resistant, but they do not have the natural brittleness of tungsten, which means they are not easily broken. Ceramic rings are available in bright white or black and are a unique alternative to standard alloys. Black ceramic wedding rings are non-metallic jewelry. Unlike black tungsten rings, black ceramics are pure black and do not show any other color if scratched. It was rated 8 on the MOH scale, making it the most durable wedding ring in addition to tungsten carbide. This is quite surprising for most people because black ceramics are also very light. Ceramics are generally considered to have the best quality of titanium and tungsten carbide. Compared with tungsten, it is light in weight, scratch resistant and crack resistant. Price is another attractive attribute because they are relatively cheap compared to others. When observing any ring, it is important to consider safety and comfort. With ceramic rings, you don't have to worry about this because ceramic materials do not include metals known to cause reactions such as copper and cobalt. Many people find ceramic rings to be more comfortable to wear because they come with an optional comfort. A ring with such a comfortable fit will have a rounded inner surface that grips the fingers in a manner different from the metal ring. You may be surprised to find that the ceramic ring is so durable. If your actual work requires manual labor, then the ceramic ring is the right choice for you. Even if you accidentally beat it, the ceramic material should be in good condition without any obvious damage. Ceramic rings come in a variety of styles and colors. Perhaps the biggest advantage of buying a ceramic ring is the stylish and glamorous look it offers. Most people choose to wear a ring as a fashion accessory to dress up their look. Ceramics offer a classic style that is suitable for almost any type of clothing. 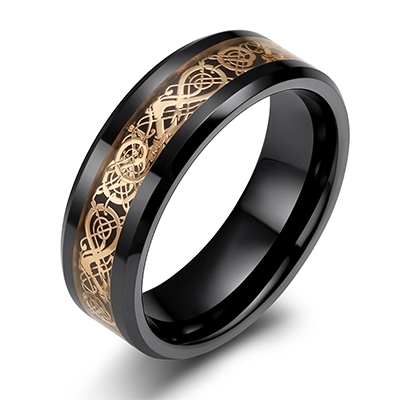 In terms of color selection, the most common choice for men's rings is black. Because ceramic rings are non-metallic, they are a good choice for those who cannot wear metal jewelry and can be used as a wedding band because it is not as conductive as an electrician. Metal jewelry can also transfer current to sensitive equipment such as computers and cause damage. By wearing a ceramic wedding ring, people no longer need to remove it to avoid injury or damage to electronic equipment when they go to work. In addition, when the metal detector is passed through the airport, since the ceramic ring is not made of metal, it is not necessary to remove the ceramic ring. One of the biggest benefits of ceramic rings is that they are hypoallergenic. It is possible that you know that people with skin allergies cannot wear certain metals. Since ceramics are non-metallic, they do not cause any problems for people with skin allergies. You can wear rings, necklaces, watches and any other type of ceramic jewelry without having to worry about it damaging your skin. The disadvantage of ceramics is that it is very hard and it can easily break or crack if it falls on a hard surface. The ceramic is a bit harder and therefore slightly more brittle. In addition, you need to be aware that the ceramic ring is not adjustable due to the unique nature of the material. Therefore, be sure to measure your ring size first when buying a ceramic ring. HOW TO CARE CERAMIC RINGS? While ceramic rings are durable and resistant to most types of damage, they do require some level of maintenance. In terms of care, ceramics are much like tungsten. This is very low maintenance. In most cases, it only requires simple soap and water to clean the ring. In fact, we recommend not using something that is harsher than mild soap. Harsh chemicals can break the surface gloss and eventually lead to a turbid appearance on the surface. To clean the ring, it is recommended that you wipe the material with a damp cloth and then wipe the ring with a different lint-free cloth. If you have a white ring, you should clean the ring with water and a mild detergent. Before putting the ring back or in storage, you need to make sure the ring is completely dry. 1. Clean with warm water and mild soap. Do not use irritating chemicals such as ammonia or bleach. 2. Although your ceramic strap has strong scratch resistance, it may break when applying enough force, such as hitting it with a hammer.